Energy has always represented both a vulnerability and an opportunity. It was a lesson I learned as U.S. ambassador to Saudi Arabia in the 1990s, and it became even clearer to me as I prepared to assume the job of secretary of the Navy under President Barack Obama. The scientific verdict on the disastrous climate impacts of fossil fuels continues to be reinforced, but as secretary, I tried to highlight the key role energy plays in our national security. At the height of U.S. involvement in Afghanistan, we were losing a Marine, killed or wounded, for every 50 fuel convoys in Afghanistan. In the first few years of my tenure, multibillion-dollar increases in fuel costs forced us to cut back on much-needed maintenance. At the same time — and still today — Europe’s dependence on Russian gas gave Russia strategic leverage. In October 2009, I set five goals for the U.S. Department of the Navy, the most important of which was to have at least half of the energy the Navy and Marine Corps uses — ashore and afloat, in the air, on the sea, under the sea, and on land — come from alternative, renewable sources. I’m proud to say that ashore, we completed our work four years ahead of schedule. We were able to acquire 1.2 gigawatts of renewable energy at a net present value savings of $400 million for our land-based facilities. 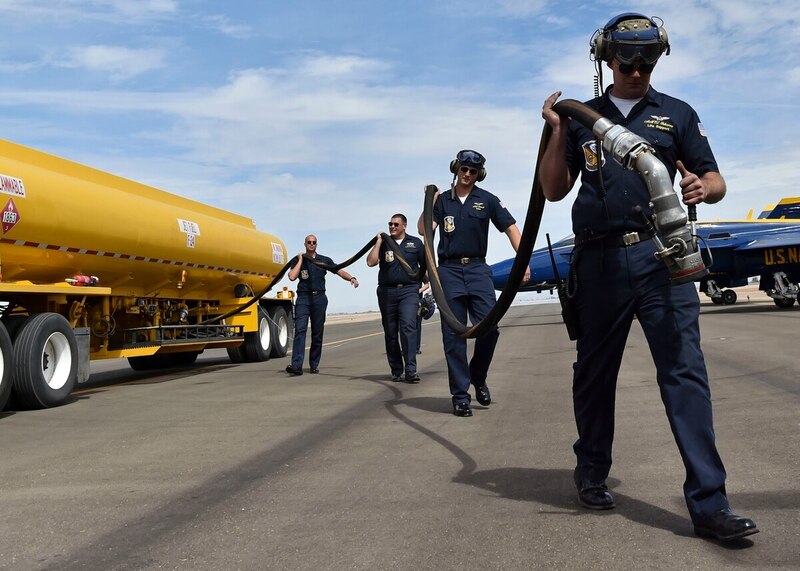 Meanwhile, we secured two of the largest sustainable fuel contracts in U.S. federal history, a savings to the Navy of a penny per gallon on a 90-10 biofuel blend in 2015, and 25 cents per gallon on a 70-30 biofuel blend in 2017. Sustainable fuels provided choices sailors and Marines did not have before and improved our energy security. Improving the Navy’s ability to project and protect U.S. interests around the globe was always our first priority. However, our actions had a great side benefit for the global climate, with 50 to 90 percent lower greenhouse gas emissions, and we were reducing emissions in an area of the economy — the transportation sector — which now generates the largest share of greenhouse gas emissions in the U.S. The science is irrefutable that emissions from transportation and all other sectors are having a clear and irreversible impact on our climate. According to the U.S. government’s Fourth National Climate Assessment, released in November 2018, the lower 48 states have warmed 1.8 degrees Fahrenheit since 1900, with an increase of 1.2 degrees in just the last few decades. By the end of the century, the United States will be 3 to 12 degrees hotter depending on how much greenhouse gases are released into the atmosphere, according to the assessment. The challenges are clear and incontestable, but just as clear are the opportunities offered by a clean-energy economy. We ignore the vulnerabilities and opportunities at our peril. The time for deep reflection and contrived debate is over. We must act, and we must act now. While so many in the sustainable fuel-supply chain — from feedstock providers and fuel producers to researchers — are doing everything in their power to accelerate the maturation of a cost-competitive, environmentally superior, sustainable fuel market, more must be done, and more people must get involved. Policymakers, government and business leaders must take their cues from those dealing with these challenges in places like Queensland, Australia; Oslo, Norway; San Francisco, California; Singapore; and Seattle, Washington. The energy market needs clear and consistent signals, coupled with the appropriate combination of carrots and sticks. At the same time, we cannot allow the perfect to be the enemy of the good. What we need are “both-and,” not “either-or” solutions. We must adopt solutions that derive value from existing resources and waste streams today, while simultaneously pursuing purpose-built, agricultural pathways for tomorrow. For example, leaders of large, progressive corporations who see the triple bottom-line value of energy alternatives must push themselves to look beyond simply buying carbon offsets. They must harness their purchasing power as well as influence and actively seek sustainable fuels. Aviation presents its own particular challenges — but also real opportunities. In the decade since the first biofuel-powered flight of a commercial airliner in 2008, significant progress has been made to advance the aviation biofuels industry. Yet commercially successful players have been few. While significant advances have been made in the development and deployment, market penetration has been shallow. Significant support from both public and private sectors will be required if it is to soar to the lofty heights envisioned by advocates. There is no better place for corporations to start their efforts than executive business jet travel. With business jet fuel typically being three to four times more expensive than standard commercial aviation fuel, it’s worth a hard look at buying your way into the solution, rather than just buying your way out of a problem. Make no mistake, carbon offsets are good, but shifting to more sustainable, lower carbon options is even better. Likewise, large corporations can send a strong signal to commercial airlines by shifting their travel dollars to favor airlines that are also using sustainable aviation fuels and are invested in their outcome. Science, economics and our security all dictate that we change the way we operate and use energy, just as we did with the U.S. Navy. Now is the time for us — all of us together — to seize the moment, to lead our nation and the world to a new energy future: a future that simultaneously strives to electrify the ground transportation sector while decarbonizing the liquid fuels that will be needed for years to come.